This is Pharos, a source of light and shadows at the outer limits of the internet. You are stepping across the unfenced edge and into an unknown land. Your visit here might change you forever. Welcome. This document was most recently revised on Wednesday, March 13, 2019. 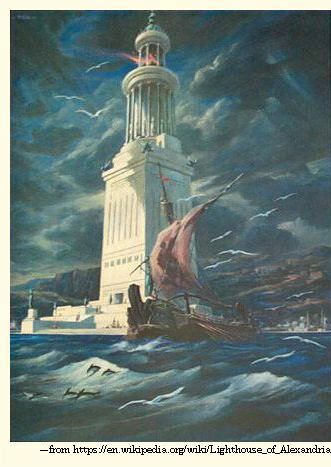 The name of this website, Pharos, follows from that of the lighthouse built on the island of Pharos, near Alexandria, Egypt, during the third century B.C. As a writer, a teacher, and a philosopher, I seek guidance for myself and for others. Light is often figuratively associated with proper attitude and behavior, as for example in the concept of enlightenment. One particular truth is this: a light produces both illumination and shadows. It might illuminate the truth and at the same time provide shadows that can hide lies. I see hope, however, in the possibility that many people can be keepers of the light. There aren't any shadows when light comes equally from all directions. It is therefore important to remember that nobody owns the light. My view of organized religion is that it doesn't have much to do with a belief in God. Organized religion seems to be mostly about obeying the clergy, with God as the clergy's badge of office and "big stick". The consequences of disobedience appear to be, variously, secular criminal prosecution and punishment, defamation and slander, shunning, excommunication, exile, torture, death, or whatever other punishments the particular clergy have the power to impose. As an alternative, I suggest that God intends for us to think for ourselves. It's the clergy, not God, who try to coerce us into darkness, to deprive us of the light. May God grant us the will to seek the light, the skill to find it, the courage to choose it, and the wisdom to make it endure. An army, great in space, may offer opposition in a brief span of time. One man, brief in space, must spread his opposition across a period of many years if he is to have a chance of succeeding. The legitimate boundaries of lawful government are not geographical. They are contractual. To be money, a thing must be durable, portable, divisible without loss, available in limited quantity, generally accepted as money, and must have intrinsic value as money. The better a thing satisfies those rules, the better it will work as money. Return with us now to those thrilling days of yesteryear, as The Lone Raver writes again. The U.S. constitution provided for the existence of a police state. It was void from its inception due to procedural violations and errors during its creation and enactment. It has been further corrupted by void amendments. The states that originally joined it were in breach of contract, by doing so, under the Articles of Confederation. I have long advocated the termination of the federal union and the restoration of the American states to the status of politically independent nations. But although contracting Nations cannot like individuals avail themselves of Courts of Justice to compel performance of contracts, yet an appeal to Heaven and to Arms, is always in their power and often in their Inclination. I spent nineteen years in the government school system. Seven of those years were in college. Eventually, I recovered from the brainwashing and from the mind-conditioning. Public property is a contradiction in terms. The feminists' alleged pursuit of equality was a lie from the very beginning. Successful communication using the English language seems to me like pretty good evidence in support of the existence of telepathy. The Pentagon wasn't hit by an airplane. They didn't seem to fit into any of my other categories. Most situations are easier to get into than out of. I got the idea by reading the excerpts from the notebooks of Lazarus Long, in Time Enough For Love, The Lives of Lazarus Long, by Robert A. Heinlein. The longer we wait to solve an environmental problem, the fewer choices we will have. If we wait long enough, then we probably won't have to make any choices at all. However, the resulting environment might be one in which we're not included. I'm presenting these video clips here for academic, educational, bibliographical, and documentation purposes, in support of statements that I quoted. Courtesy is a great virtue, as is patience. I have some of each but I'm not a saint. So, be cautious about how you criticize me. If I'm sufficiently impressed with your comments, then I just might put them here, for all of the world to see.